So tiny, a bunch will fit into a teaspoon! Seeds produce tomato plants that grow tall and fruits are super sweet when picked fully ripe off the vine. Heirloom Seed Packet. 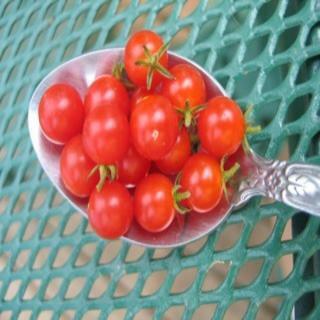 Spoon tomatoes are so tiny, a bunch will fit into a teaspoon! Plants grow tall and fruits are super sweet when picked fully ripe off the vine.